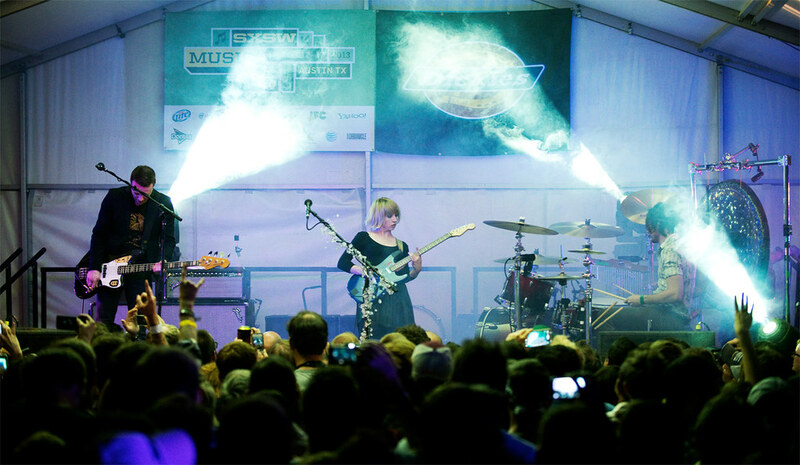 Lustre Pearl hosted Joy Formidable during Friday's SXSW Music Festival. Waking up to start day 4 of SXSW with the exhilarating feeling of more music but also the sadness of the coming end of this great music festival. Exhausted but carrying on, watching 6th Street begin to wake up faster than the night cleaning crew could wipe away the previous night's debauchery and mayhem. Friday night promises to bring an onslaught of weekend partiers and some of the music industry's heavy hitters - Justin Timberlake, Prince and Smashing Pumpkins are rumored to be playing secret shows. But that's a mere hours away. The day is still young and the first sounds of music begin start to bleed out onto the Austin streets. Surprisingly, fans are even seen this early to catch their favorite band - YOLO, right? 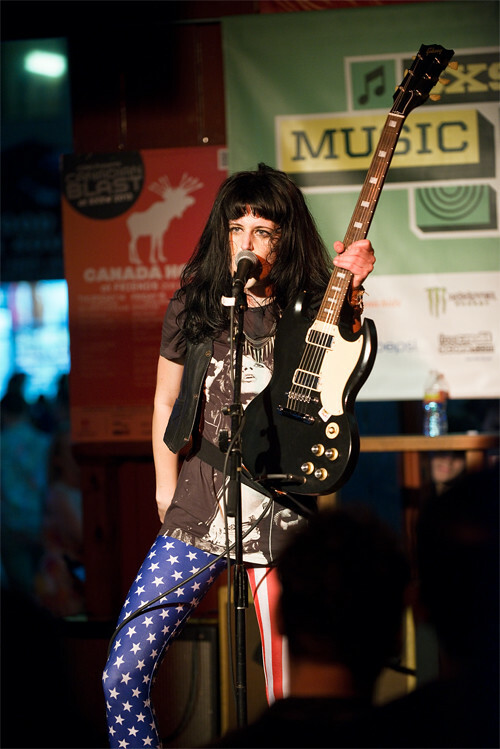 Dollyrots performing for The Music Saves Lives Showcase during SXSW. The punkish pop sounds of The Dollyrots lured me to The Firehouse. They were playing as part of The Music Saves Lives Showcase, a mission to educate people about the importance of blood donation and the bone marrow registry by using music and entertainment to get the message out. 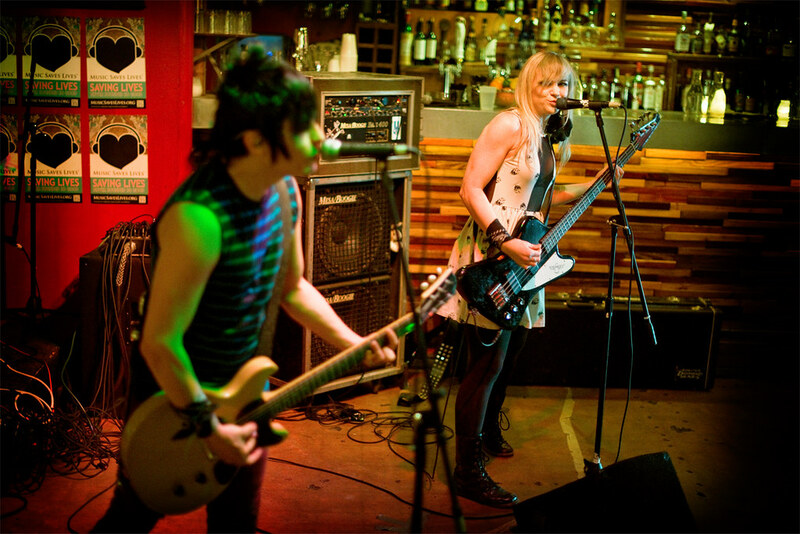 The Dollyrots, let by Kelly Ogden and Luis Cabezas had one of my favorite albums last year. Fully fan supported via Kickstarter, their self-titled release strayed away from the bubble-gum punk-pop heard on their earlier records showing us a more mature side of the group. Actually, this album, along with their last "A Little Messed Up," have showcased their growth in music; more polished and more three-dimensional. 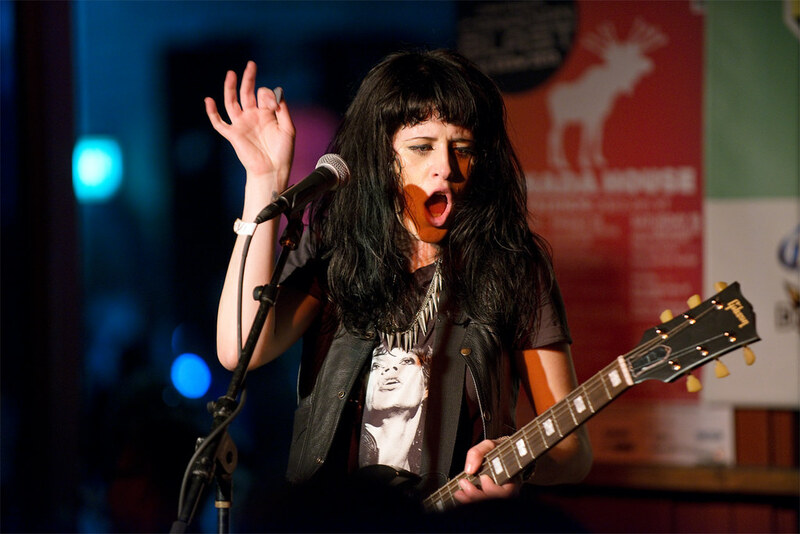 Very hook-oriented, catchy lyrics that'll make you want to sing and dance like no one's watching, power chords along with Kelly's adorable vocals make The Dollyrots worth watching in person to see and hear these songs performed live. 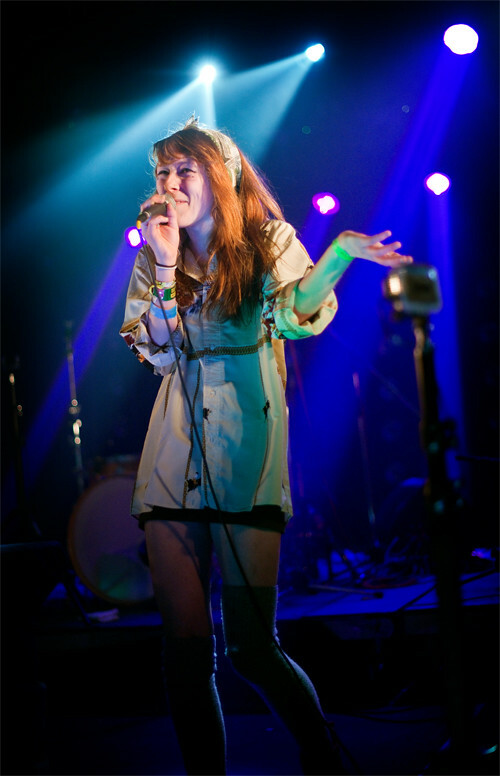 After The Dollyrots, it was back to my favorite venue, The Hype Hotel, to catch Florida teen-rapper Kitty Pryde. Her hypnotic, slacker-rap song, "Orion's Belt" is contagious and hard not to like and has been viewed over a million times on YouTube. But it was her performance filled with nervous energy and bouts of giggling during her songs that left most at the Stereogum showcase scratching their heads. There's no mistaking Kitty's talents though. With her brother as DJ and filling in for Riff Raff during her hit single, the two looked as though they were having the time of their lives up there on stage and that's what's important. Next up was Sky Ferreira, who now lives in New York and comes across as the anti-celebrity. She's been battling the loss of her voice this week (recently admitting at her Red Eyed Fly gig the day before) but she gave it a go. And you could tell she was still under the weather, singing subdued, mostly in darkened silhouette and bathed behind her a glow of striking spotlights. 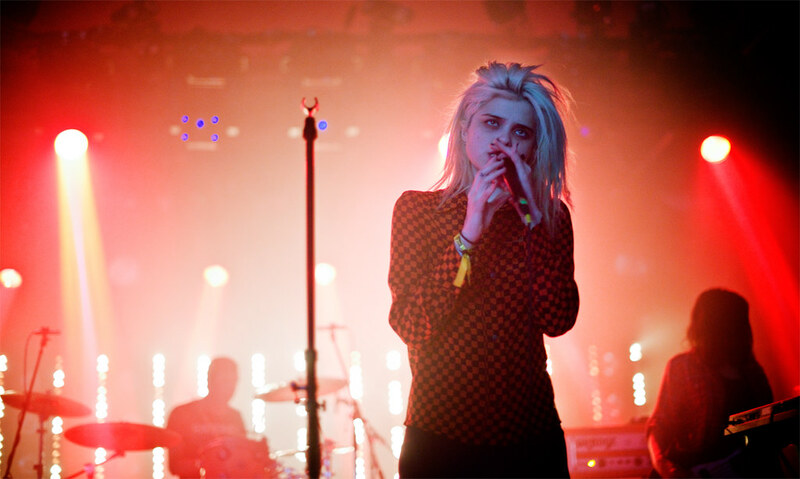 Sky Ferreira performs at The Hype Machine's Hype Hotel during SXSW. Sky begins her US tour later this month that runs through July. She has two stops in Los Angeles when she performs at The Bootleg on April 10th and 11th which I've already bought tickets for. It was another great day of perfect weather in Austin and by making the long walk across town to Red 7, I got a chance to view beautiful 6th Street during the day. Bars literally lining up, back-to-back, on each side of the street, its architecture and feel reminding me of a cross between Old Town Pasadena and SilverLake. 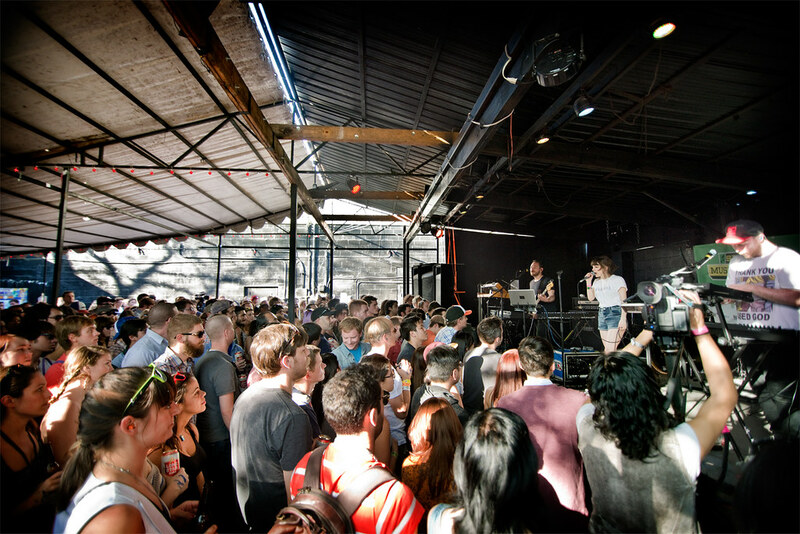 Crowds jammed Red 7 to watch CHVRCHES, from Scotland, during SXSW 2013. At Red 7, their last show for the day, I caught Scottish buzzband Chvrches for the second time. Outside in the patio section, it was wall-to-wall. Apparently, the buzz created around this band is legit. 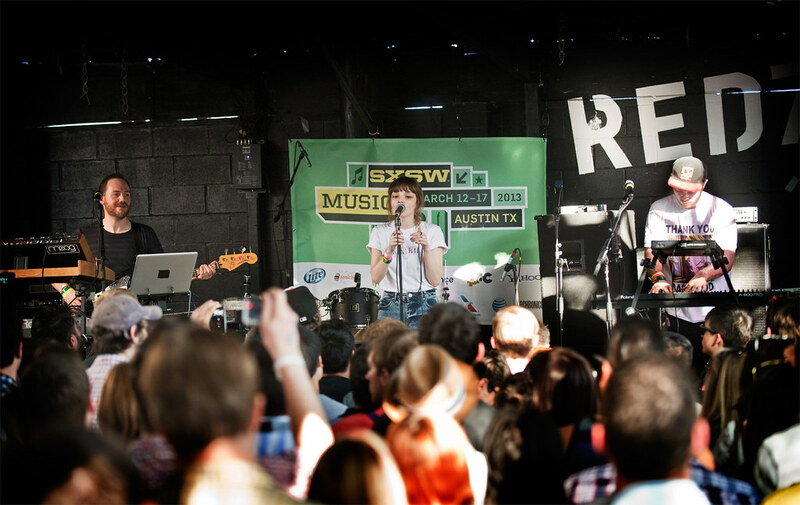 Front-woman Lauren Mayberry complained about the Texas heat; coming from cold-weathered Glasgow, they simply weren't used to this type of weather (it was mid-70's this day). Selling out venues on their first U.S. tour and with their SXSW debut, Chvrches was just awarded the first annual Grulke Prize for Best Non-US act. The Grulke Prize (awarded in three categories: Developing US Act, Developing Non-US Act and Career Act) is given to artists who are breaking new ground with their creativity and show the most promise in achieving their career goals. Formed in 2011, Chvrches were on the list for this year's BBC's Sound of 2013. Their catchy synthpop sound and alluring (and highly educated) vocalist, Mayberry, made them one of the bands to see at this year's festival. After their set, a handful of people stayed behind (including myself) to talk and take pictures with Lauren where I got a chance to ask them about their upcoming album and when they'll be back touring the U.S. Chvrches heads back to the US this summer for 17 stops with a Los Angeles show at the famed Troubadour on June 1st. Their album is slated for release this September. Filter Magazine was holding some of the go-to showcases of the night. At the Tumblr Presents show at Clive Bar, KITTEN was gearing up to close their SXSW experience opening up for Macklemore and Ryan. More house party than concert, lines were already forming around the converted bungalow house into full-fledged club. An erected stage in the tiny backyard would guarantee this night to be a rowdy show. And it was. Kitten led the charge with their explosive set. Nearly back flipping into the crowd and climbing atop speakers during their now much-talked about raucuos performances at this years' fest. Next up for the Kitten is a couple of tours supporting Joy Formidable and Paramore starting next month. 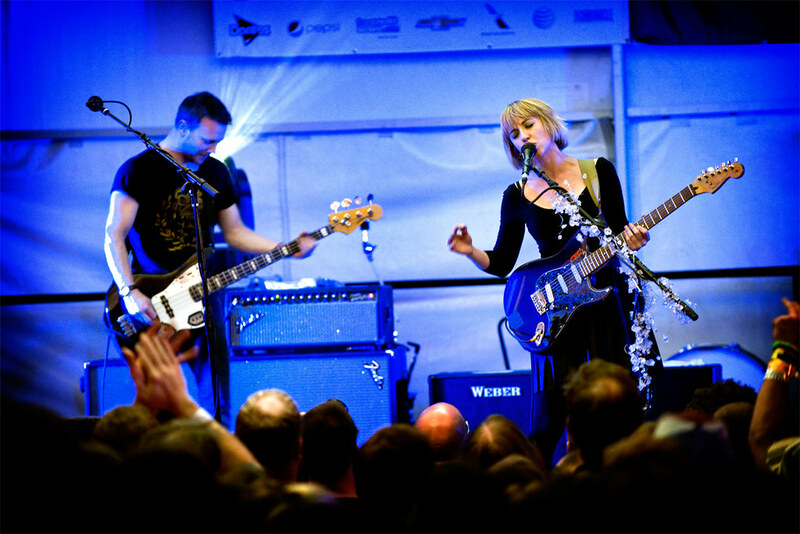 Joy Formidable rocks out at The Lustre Pearl House presented by Filter Magazine and Dickies during SXSW. 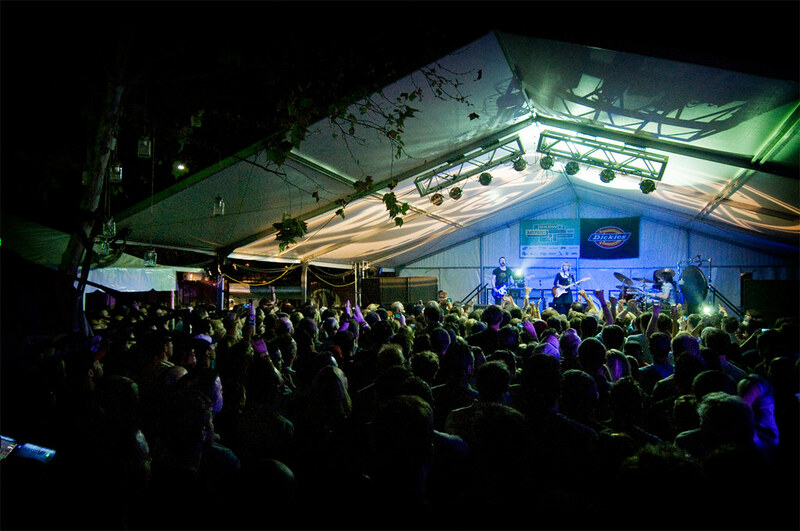 While across the street, at The Lustre Pearl House, Filter Magazine and Dickies were hosting a much bigger house party featuring Joy Formidable and Fitz and the Tantrums. Bathed in the soft glow of firefly lanterns hung from tree branches, the ambience promised a quiet and intimate setting with the serene backdrop of downtown Austin's skyline. That soon dissipated as Joy Formidable's thunderous sounds of aggressive guitars not only poked a hole in that peaceful atmosphere, it obliterated it. Opening with the hooky, melodic guitar assault "Cholla" off their latest album Wolf's Law, lead singer Ritzy Bryan knows how get the crowd into a frenzy. With her petite frame, thrashing a guitar is a sight to behold even when she ended her set throwing it over her head, crashing to the ground. No worries though, it was their last show of SXSW. At midnight, the night was still young as crowds were still going strong. At The Vice, Fall Out Boy were playing a rare while next door, at Friends Bar, The Canadian House were rockin' out to the frenetic and animated gyrations of lead singer Jacquie Neville and her band The Balconies. Dressed in leather Stars and Stripes leather pants, a nice crowd was building outside the watching through the opened windows. I first saw these guys when they performed at Los Angeles' Culture Collide Music Festival and they blew me away back then. Their flare of pop and rock and roll is something that's unique about The Balconies. Hard playing and aggressively contagious, their presence on stage is a sight to see. Their song "Do It In The Dark" is a slow, tease of anticipation until finally, they explode into a full on arena-ready rock anthem. Afterwards, still high off The Balconies, adrenelin still pumping, I head back to my hotel to try and catch some rest for my last day of SXSW. Canada House knows how to party. The Balconies performing at Friends Bar during SXSW 2013.